Wireless headphones for TV are nice for listening to your favorite show at your own volume level, but the disadvantage is that they isolate you from others and deny you from hearing what's going on around you. 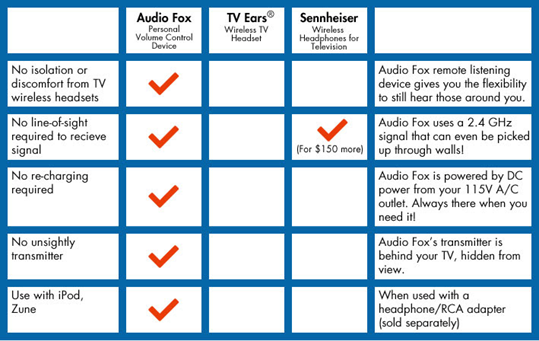 There's a product on the market called the Audio Fox. It gives you the best of both worlds. You can hear that explosive battle scene or all of those actors that whisper their lines, and still carry on a conversation or let someone read in the same room. It gives you the ultimate personal volume control. It's a never-before-seen design with two 3" speakers that are attached to thin and sleek vinyl-coated steel straps that grip the back of a chair or couch. This allows you to position the sound as close or as far as you want. The Audio Fox also has volume control and mute buttons built directly onto the speakers, so you can quickly mute or turn down the sound when needed. Your personal volume control is right at your fingertips. No more feeling left out or like a burden to your loved ones! Isn't it time you relaxed on your own terms?